Aloo tamatar ki sabzi is a very popular, quick-and-easy-to-make dish. 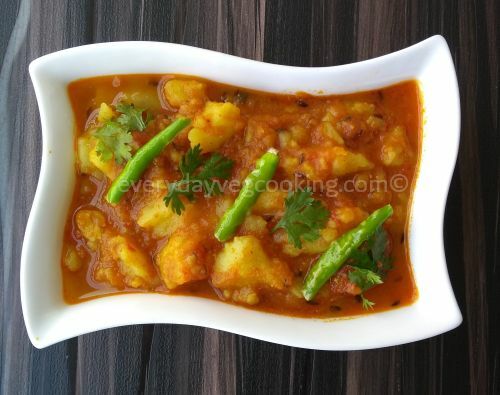 Aloo ki sabzi is a very common dish which is cooked regularly in many households. It especially holds an important place in North Indian kitchens. 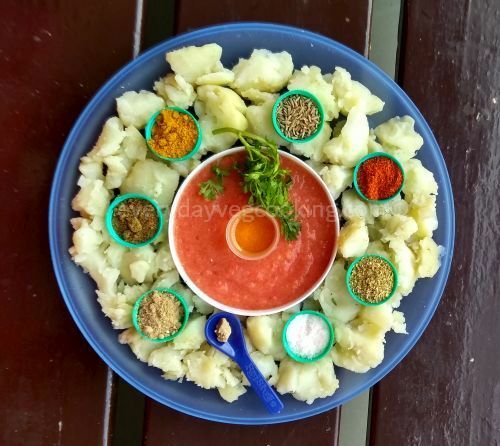 This exotic sabzi is the combination of boiled potatoes simmered in tomato gravy along with simple spices which are available on every kitchen shelf. Aloo tamatar ki sabzi is a festive dish too. We make this sabzi on Diwali, Holi, Karva Chauth, Ahoi ashtami etc. because it goes well with fried puri, kachori and bedmi puri. Peel and break them into small pieces. Grind tomatoes, ginger and green chilli. Heat oil in a pan, add jeera, and when it sizzles; add a pinch of hing. Now add tomato puree, haldi, dhania powder, lal mirch powder and salt. Saute till oil separates. Add water as required. Let the gravy simmer for 5 to 7 minutes on low flame, add amchoor powder and garam masala powder, mix well and switch off the flame. Transfer aloo ki sabzi into a serving bowl and garnish with fresh coriander leaves.